"Many of the small snorkeling boats come to the lagoon. The water was quite warm and we swam allot while there. There are two cafes for lunch or just a cappuccino. My friends ordered 'fried potatoes' for lunch, which turned out to be homemade french fries! They looked so good, I too ate 'fried potatoes' for lunch, they were quite yummy!" Padang Bai is not just a fishing village where you can take a boat to Lombok and the Gili Islands. Anyone who thinks that is wrong. They miss the charm of this little town and it's certainly a visit worth. No wonder that tourists, who are on their way to other islands (Lombok, Gili), often interrupt their journey to spend a few nights in Padang Bai. 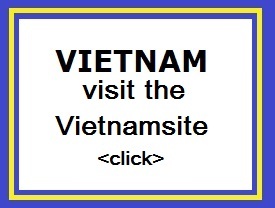 The town namely has one of the better beaches and there's good diving and snorkeling in the immediate vicinity. There are a number of diving schools in Padang Bai available and they have everything you need. Additionally, you can make from Padang Bai diverse trips to the hinterland. Padang Bai has some excellent budget and middle class hotels and several excellent fish restaurants. 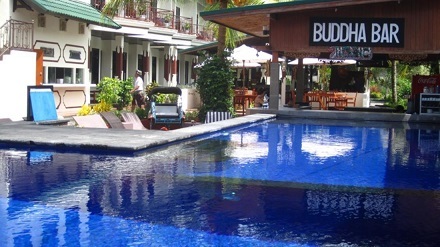 The best accommodation in Padang Bai is the Bloo Lagoon Resort. Have you had enough of the sea and / or beach? Then there are several temples to discover in Padang Bai. Padang Bai has five major temples, the Pura Dalem is located downtown, Pura Segara is located between the town and the main beach. Pura Telagamas and the Pura Tanjungsari Silayukti can be found in the east of Padang Bai. The most important of these five temples is the Pura Silayukti. It is one of the oldest existing temples in Bali. Here lived the great Hindu sage Empu Kuturan and his wisdom goes back to the 11th century. You will find this temple by simply walking to the end of the beach and then you walk around the headland. Do not forget to bring a sarong and/ or other clothing. Bias Tugal Beach also called Pantai Kecil (Little Beach), is a beautiful white sandy beach and the best beach in Padang Bai. Good for swimming, though the currents can be strong. There are several restaurants, but they are not very good. The beach is surrounded by a monstrous, unfinished resort. To reach the secluded Bias Tegul Beach, walk from the police station for 100 metres up the hill. Directly after Bamboo Paradise turn left (there's a sign that says Bias Tegul) and climb the steep hill along a construction road for about 5 minutes and then descend. Be careful going down on the hillside track. While descending - weather permitting - you should be able to see the largest mountain on Bali, Mount Agung on your left - a powerful sight. If you continue over the hill and follow the road, you will eventually come to a long, white sand beach. 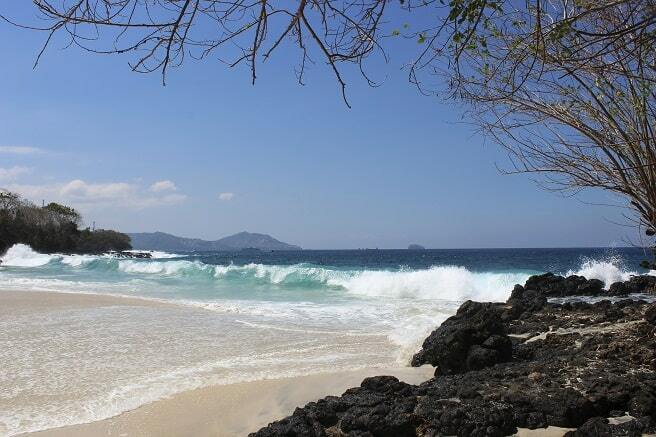 Very rewarding are the diving excursions to the offshore islands such as Nusa Penida, Nusa Lembongan or Gili Tepekong. The last island has strong (vertical) currents and rocks in the water and that's the reason this island is not a diving location for starting divers. But the chance to meet white reef sharks and larger fishes, such as manta rays and mola-mola are particularly large. Several shops in the main street of Padang Bai rent snorkelling equipment. They can also arrange a traditional jukung boat for you to take you to the best places to snorkel and they also pay attention to your safety. 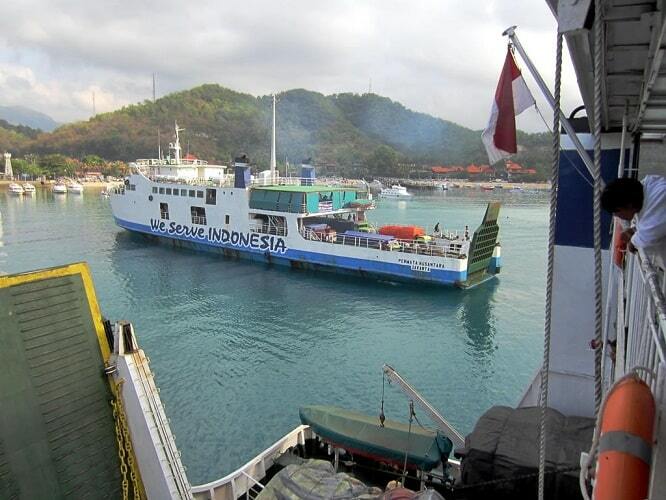 Every day leave several ferries from Padang Bai to Lembar on the island of Lombok. Every hour there is a (slow) ferry, 24 hours a day. The journey normally takes four hours (but it may take considerably longer due to bad weather) and costs Rp 50,000. One can also opt for a private cabin, but you have to pay more. The cabin is clean and comfortable with 2 or 3 beds. There is a ticket office, waiting room and small cafe adjacent to the pier. 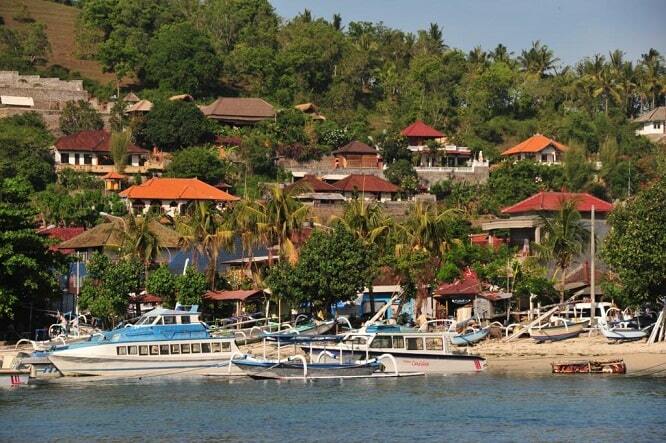 Perama has one daily ferry service from Lombok and the Gili islands to Padang Bai. The trip takes 4 hours and 6 hours of Gili Trawangan Senggigi (Lombok). Perama Express departs daily from Padang Bai at 13:30 and arrives at 19:00 in the harbor of Gili Trawangan at 21.00 in Senggigi (Lombok). The best thing to do is to buy on the boat aleady the bus tickets for the destination Lombok. It saves you a lot of discussion with touts of competing bus company little, when you have to look in Lembar for a connecting bus. Look out for the luggage mafia if you go aboard the ferry. They ask ridiculous amounts for carrying your luggage. Give your luggage not out of your hands or make in advance a clear pricing agreement. Located in Padang Bai, Padang Bai Beach Resort is the ideal base for relaxing and comfortable accommodation. Due to its key location, guests are able to access several interesting attractions such as Blue Lagoon and White Sand Beach. This dive resort offers quality rooms, all of which are fully equipped with standard facilities. Apart from excellent facilities and services, Padang Bai Beach Resort also provides plenty of recreational activities to ensure that guests are having a pleasant stay. If you are looking for good accommodation in Bali, Padang Bai Beach Resort is definitely a smart choice at all costs.